Cervical collars, or neck braces, are typically used for post-surgical applications to control the range of motion through the cervical spine. They can also be used for long-term control of range of motion when surgical repair is not an option. 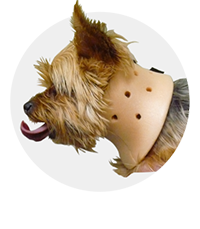 A cervical collar is molded from a cast of the dog's neck and is typically made of a light-weight foam, though they can be made more structurally substantial for larger dogs.